In 2013, Eve L. Ewing, then a graduate student at Harvard University, read in the Sun-Times that Bronzeville’s Pershing West Middle School, where she once worked as a science teacher, was one of 129 public schools in Chicago that were slated to close (this was later narrowed to a shortlist of fifty-four). Ewing had to read the announcement again and again to try and understand, and her confusion only grew over the following weeks. “The researcher in me was intrigued and puzzled, the teacher in me was mourning, and the Chicagoan in me…was skeptical,” writes Ewing, now an assistant professor in the University of Chicago School of Social Service Administration. The community was outraged and confused at the disproportionate impact of the closures on certain communities: eighty percent of the students affected by the shortlist closures were Black. And yet Barbara Byrd-Bennett, then-CEO of CPS, was quick to push back against the outraged accusation that these closures were racist—the schools were simply underutilized and underresourced. “How could the person charged with doling out resources condemn an institution for not having enough resources?” Ewing asks. 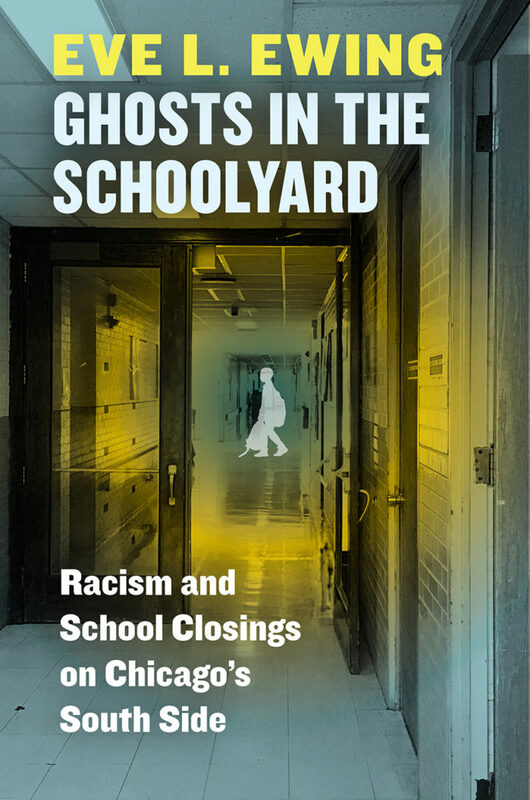 Her confusion over the conflicting, inconsistent, and even illogical explanations coming from CPS led her to study the closures as part of her dissertation at Harvard, which, in turn, led to her upcoming book Ghosts in the Schoolyard: Racism and School Closings on Chicago’s South Side. If these schools were failing, why did Black communities protest their closure? Ewing spends much of the book addressing this question, centering her arguments around a few key tenets: one, arguably, these schools weren’t failing; two, CPS and the community disagree on the definition of a successful school; three, that CPS fails to acknowledge the long history of segregation behind the state of these schools; and four, a school is not just a school, but a community institution. “The present is not inevitable,” writes Ewing—these schools are underutilized for a reason. In her second chapter, “City of Losses,” she outlines a long history of enforced segregation and institutionalized racism in short, broad strokes. In the wake of the first Great Migration, restrictive covenants—contracts among property owners that prevented Black people from buying or renting in certain neighborhoods—and the threat of white violence forced Black Chicagoans to cluster in tight enclaves. By 1940, Bronzeville was twice as dense as the rest of Chicago. The Chicago Housing Authority exacerbated issues in its high-rise public housing buildings by enforcing a policy of favoring families, creating a dense population of youth. These youth were served by schools that were over-crowded, lacked funding, lacked full-time teachers, and had class sizes of up to forty students. Despite the government-caused overcrowding, parents couldn’t move their children to other schools due to enforced segregation, as white people didn’t want Black students in their neighborhoods or schools. CPS is continuing to operate by plausible deniability—if they don’t acknowledge the past, and continue to frame closures through a numerical, seemingly neutral lens, the closures come off as necessary evils. To analyze different attitudes towards the closures, Ewing uses critical discourse analysis, which sees speech as a form of action—when a person speaks, they are doing something, revealing the ideologies, inequality, social relationships, and political institutions that might be backing their analyses. Ewing’s careful and steady interpretations of wording, language, and presentation pick apart the debate over these school closures in a way that is ultimately powerful and convincing. During the hearings about school closures in 2013, CPS framed these closures through a numerical lens that made their decisions seem both transparent and impossible to challenge. “By implicitly presenting these questions as settled—as a given, as something we have all agreed on—district officials suggest that this is neutral evidence,” writes Ewing in her analysis. “We are to understand that these are the things that make a school good or bad and that this is beyond dispute.” Schools in this framework operate through a free market system based on competition and free of historical context: the best schools succeed and the worst get better or fail. But little of this actually carries out in reality. Black parents don’t have many options choosing a school for their children, limited by issues of transportation, information, and time. In 2009, University of Chicago researchers found that the students displaced in 2013 performed worse academically the year before their schools closed. The researchers also found that few students actually moved on to top-ranked schools—and the six percent who do have to travel an average of 3.5 miles to get there—meaning that the closure helps few actual students. And it’s worth noting that while CPS claimed to have too many empty buildings and not enough students, it added a number of new charter schools around the time of the closures. Parents and community members also weren’t pleased at the insistent focus on numbers, as if schools were only machines meant to pump out results. At the hearings about the school closures, parents, educators, and students defined schools as families, as well as anchors of Black history and legacy within the community. Walter H. Dyett High School, for example, was named after an iconic educator who taught musical legends as well as thousands of average Bronzeville teenagers a love of music. It means something that a school was named for him—it helps to keep his memory alive, and so keep alive part of the history of the South Side. In accordance with her methodology, Ewing quotes extensively a series of interviews she conducted with educators, students, and family members, allowing community voices to speak for themselves. She finds that in their stories, they express a sense of shame and an anxiety that they will be marked for having been at a “failing” school. People mourn their schools, and they mourn what it means about their community that CPS decided their school should be closed. “The people of Bronzeville understand that a school is more than a school. A school is the site of a history and a pillar of black pride in a racist city. A school is a safe place to be. A school is a place where you find family. A school is a home,” says Ewing, and then, with a pause you can almost hear through the page: “So when they come for your schools, they’re coming for you.” For now, the mourning of these institutions is the best that communities can do to preserve their Black histories. When parents, students, and educators fought for their schools to stay open, they were “arguing that their vision of the world, their experience, their very reality was valid.” Schools were not just a story of numbers, but a question of relationships and history—a history that CPS was trying to erase and deny. Ewing is blunt about the way that CPS’s administration repeatedly dismisses Black voices and lives. She pays special attention to just how “public” the Board of Education hearings really are: they take place at 10:30am on Wednesday mornings, there are special procedures to sign up to speak, there are strict time limits, and an overflow of emotion can get you removed from meetings—Ewing once saw the CTU treasurer being removed from a hearing after she started crying. It’s a compelling question, given the result. Eventually, with no mention of the protests or of the Coalition’s proposal—for a high school focused on green technology, social justice, and environmental sustainability—CPS announced Dyett would be reopened as an open-enrollment arts high school. Political leaders and decision makers are loath to have an honest conversation about the racism we still live with and the ways it may affect our current reality,” writes Ewing. For her, the road to actual improvement involves structural changes in CPS that let stakeholders meaningfully incorporate and consult Black communities so that they are given ample opportunity to defend their institutions and help decide what is best for their children. Voicelessness is a common theme in this book, but through her amplification of the voices of the Bronzeville community, Ewing gives the protestors a voice over that of CPS. Her own voice as witness, as someone who was there, is powerful in this book, and lends itself to the anxiety and anger in its pages. Near the beginning of her book, Ewing alludes to the idea that a community can contain its own answers—that agency means something like a community addressing its own issues and having a say in the solutions. In that context, objectivity is not only impossible for Ewing, who herself taught on the South Side and grew up in the CPS system, but ill-advised. And in this book, we see that dynamic play out. CPS presented objective numbers as their main source of evidence, failing to account for human and historical impact. In Ghosts in the Schoolyard, Ewing’s own sadness contributes to the indignation at the lack of responses from CPS and at the lack of acknowledgment of the long history that has trapped Black schools into a spiral that CPS refuses to take responsibility for. Her own mourning helps to amplify the mourning of those she interviews, quotes, and defends. In her introduction, Ewing tells the reader of her quest to understand something that confused her completely but shifted into a kind of preservation: “in the end I hope to have documented the injustice and resilience and desire and agony of this singularly important community. I hope I can keep black history from going away. I hope to help us understand, and remember.” Ewing takes the narrative away from the hands of CPS, shaping it herself instead, and putting it back out there with the voices of Black communities, the stories that are Black history, amplified. Students on the South Side today are still fighting the same battles that their predecessors faced—from the sudden closings or “phase-outs” of four high schools in Englewood to the controversial plan to repurpose the National Teacher’s Academy—a mostly Black Level 1+ elementary school, into a high school that will serve the Near South Side, which has long been advocated for by wealthy South Loop homeowners—to its current policies of furthering segregation in its capital projects, as investigations by WBEZ and Chalkbeat Chicago have found. As students, teachers, and parents protest these changes, Ewing’s arguments hold true: CPS is still not incorporating community voices. Ultimately, her book demands the right for communities to envision their own solutions, and calls for CPS both to listen to the actual needs of these neighborhoods and acknowledge the histories that come with today’s issues. CPS has been ignoring the voices of the community, but Ewing has been listening, preserving, and investigating. Ghosts in the Schoolyard reminds us that this is not a fight relegated to the history books. It is happening now—and we should be paying attention. Eve L. Ewing, Ghosts in the Schoolyard: Racism and School Closings on Chicago’s South Side. University of Chicago Press. $22.50. 240 pages. The book’s launch party will be at the Chicago Teachers Union Center, 1901 W. Carroll Ave., on October 18 from 5pm–7:30pm. Free admission, $25 for admission and a copy of the book. Leah Rachel von Essen is a staff writer at the Weekly. She is a Hyde Park resident who writes for Book Riot and reviews books at While Reading and Walking. She last wrote for the Weekly in May about Landscapes of Hope, a new history of Black Chicagoans’ complex relationship with nature.